In this bonanza of diamond dust halos, where a whole line rare halos have become mundane, 44 parhelia has maintained its dignity. For one thing it is not a halo to be observed with lamp. And in sunlight it seems to need a wast area of ice crystals, which is rare in snow gun displays. So, it is a good catch Jari. It was also close for me catching it - was late from the scene about 20 minutes. Regarding the 44 degree parhelia and lamp displays, I think it's possible to capture this phenomenon as well. Won't be too easy, though. Time will tell. Very nice indeed! Multiple scattering is such a remarkable way for sun light to find its way to observers eye in form of a halo, that I would very much like to see this kind of a display one day. Like Marko said, multiple scattering has not lost its glory. I doubt if 44° parhelia can ever be captured with our spotlights, although intuitively it would seem possible cause there are so many crystals in the beam sometimes. However, the amount of crystals may be too little still. Like in this display Jari said that the depth of the crystal area was several kilometers. To my view there are just a couple of crystals in the spotlight beam, especially in the area where the parhelion is at 22 degs distance - which is very close to the camera. 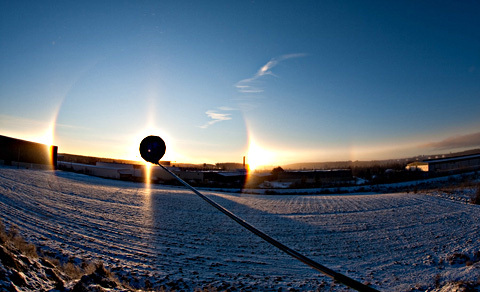 The parhelion also spreads inwards, which distributes the intensity, further reducing the chances for 44 parhelion. As 44 parhelion is a parhelion of parhelion, the normal parhelion should be blindingly bright in a spotlight beam to cause its own parhelion. I promise a pizza for the one who succeeds to capture 44 parhelion with spotlight. My thinking is that you can indeed record blindingly bright parhelia in lamp displays provided you just give it enough exposure. Stacking could then reveal the 44 degree parhelia. But I may very well be wrong too. So far there has been no signs of it. Either way, I rank this case very high in my personal list of top observations. Multiple scattering indeed has that special elusive quality that I could feel when I finally saw the 44 degree parhelia. I had tried in several locations that morning and after much driving and running and panicing it finally appeared... magic! How wide are the spotlight beams typically at observation distance? That is, how far away from the observer are the glimpses of light in your huge lamp displays? I try to visualize the light paths of 44 parhelia as viewed from above in this display and a supposed lamp display. In sunlight (really wide non-divergent beam) multiple scattering can occur at a variety of distances between the incident crystals as well as between the observer and second crystal (two degrees of freedom). Now if your beam was a couple of meters in length I'd suppose the crystal swarm density would need to be huge to get the situation described above. Could the 44 parhelia ever be distinguished from parhelic circle for instance? The divergence effect mentioned by Riikonen also eats the intensity. An other option would be to stand far away from the beam in a wide crystal swarm. Then the first scattering would occur in crystals lit by the beam and the second scattering on the straight line between the observer and the observed 44 parhelia. Now there's one degree of freedom left. Might these kind of conditions be enough? I don't know if any of this makes sense to you. Maybe I try to draw pictures of what I mean, soon. I think the displays form mostly in crystals close to camera, just a few meters away. Should make experiments on this by blocking ever larger area of the central beam. Anyway, I have never seen lamp parhelia that I could say is bright. But I have seen bright tangent arcs. So, one could as well think about multiple scattering with the tangent arc. Yes that 44 parhelia you don't see it as much I wonder if you get back far enough from the light with a very large plate crystal swarm could one get 44 parhelia then? Pizza sounds good with especially if its the pan crust version From Pizza hut served with a cold can of Jones sugar cane sweetend soda or Red Bull cola. There is a limit how far you can get, as the halos start getting pretty soon fainter. Even if the location allows taking distance, I usually don't get further than about 100 meters. It depends also on the display. Displays with pure, well oriented crystal allow more distance.